I found this clock at Eclectix, a unique consignment store, in Boulder, Colorado. This a Dutch Folklore Stoel Clock, circa 1930. It is called a stoel, or stool, because the clock case has legs like a stool and sits in the housing which hangs from the wall. These clocks come from the Province of Friesland (the “F” on the filigree at the top of the housing is for Friesland) which is in the northern part of The Netherlands. 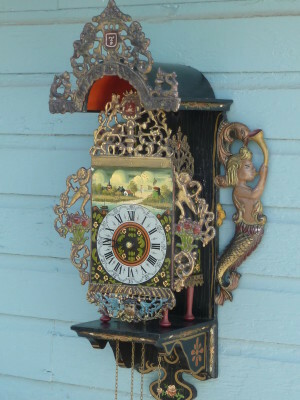 The case and housing are made of wood with cast iron mermaids, cherubs, and filigree at the top, sides and bottom all painted in the Hindeloopen Style named after the City of Hindeloopen. 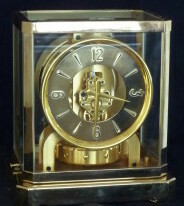 This particular clock is 31″ high, 16″ wide, and 12″ deep. It has a weight driven eight day movement with a pendulum and Strikes on the half hour and strikes out the number of hours.